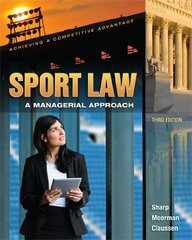 Sport Law 3 Edition This book is uniquely organized around management functions rather than legal theory. Its clear and informative approach will help you understand how legal concepts relate to specific managerial functions and will help prepare you to assume a broad range of responsibilities in sport, education, or recreation. Whether you work in a high school, college, Olympic, or professional sport organization. administer recreation programs. manage fitness/health clubs. or work as a coach or teacher, legal concerns will inevitably be woven into your managerial concerns. This book shows how knowledge of the law creates a competitive advantage and helps build a more efficient and successful operation that better serves the needs of your constituents.